The following inspirational testimonial was written by a friend of mine who recently converted to Orthodoxy from Protestantism, and is featured here exclusively in the hopes of inspiring all to embrace the Theotokos, with or without hesitation. I was raised Southern Baptist and even graduated from one of their seminaries. I had been taught to view Christianity, well specifically the elements that were not mentioned in the Bible, as examples of the paganization of Christianity. I viewed everything through the von Harnackian prism whereby Christianity becoming Hellenized was a contemptible thing. I read eloquent portrayals of Byzantine life, where they viewed the prayers of the Saints in heaven as a mirror of the Byzantine emperor's court. Because a person needed a person on the "inside" to make things happen with the emperor. Little did I understand that those who died in Christ are alive. These greatest in the kingdom are servants to all. I was chrismated into the Orthodox Church a year and two months ago after a year long catechumenate. Devotion to the Theotokos and prayer to the saints were the two hurdles I struggled with the longest. But after two years of saying my daily prayers in front of my icon corner, each day invoking the prayers of the Theotokos and all the saints, I have never found myself worshiping anything or anyone other than the Holy Trinity. 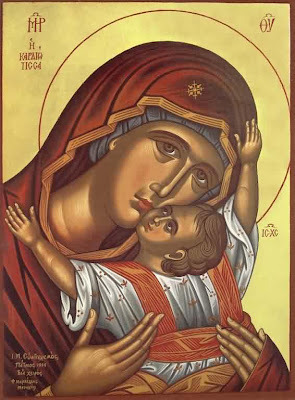 I have noticed over the last month, devotion to the Theotokos has become part of my Orthodox experience. My parish priest gave me a Christmas card that had an icon of the Theotokos on it. I taped it on the wall by my front door, and often kiss it as I am leaving or coming, as I hang my keys by it. When I kiss the Theotokos' hand, I feel grateful for the Incarnate Word that destroyed death and corruption. With that kiss I feel connected to all the Saints, past, present and future who live because of Jesus Christ's victory over death. Also, I have been agonizing about a certain decision in my life. After praying to the Theotokos I have seen some things developing. I have noticed when a certain prayer request is dear to my heart, I find myself turning to the Theotokos with it, knowing the love she has for people. Sometimes I still feel my former Protestantism creeping up in my mind saying "you are no different than a pagan praying to Aphrodite". But ultimately, it is a great comfort that the Theotokos and the Saints intercede for sinful me.